With the enormous selection of amazing and wonderful design and interior blogs out there, sometimes we find it hard to spot something truly original and unique. So when we find it, we want to share it! We’re big fans of The Brick House , a blog which originally began as her (Morgan’s) story about buying a renovating a 1950s style house, while doing it on a budget and trying to be stylish all at the same time. 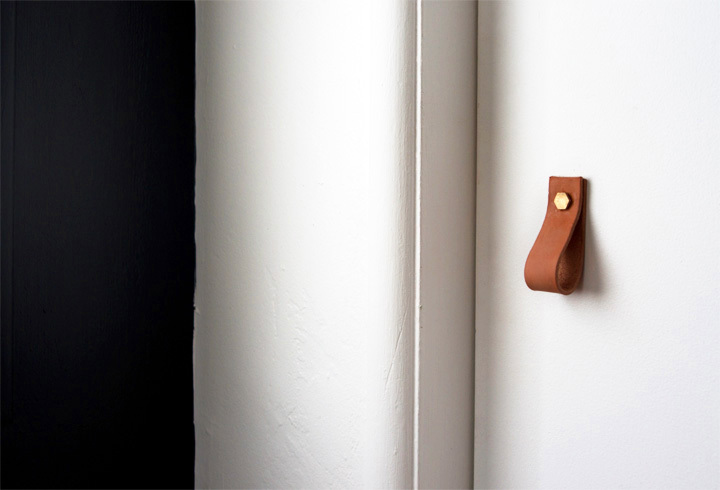 One of her recent posts tells of an inventive and stylish way to make your own door knobs – out of simple strips of leather bought from DIY stores! The result is incredible, and all the more so for being home made. Have a peek and don’t forget to explore the rest of her blog! Con una enorme selección de fantásticos y fabulosos blogs de diseño e interiorismo, muchas veces es difícil encontrar algo realmente original y único. Así que, cuando lo encontramos, ¡quisimos compartirlo! Somos grandes fans de The Brick House, un blog con muchísima originalidad que empezó como su historia (de Morgan) sobre comprar y renovar una casa del estilo del año 1950, con presupuesto limitado e intentando que fuese estilosa al mismo tiempo. Uno de sus posts más recientes nos habla sobre la forma de hacer tus propios pomos de las puertas – ¡con simples tiras de cuero compradas en tiendas de bricolaje! El resultado es increíble, y aún más al ser hecho a mano. Echadle un vistazo y ¡no olvidéis mirar el resto de su blog!